The Compass Pointe Golf Course, located just up the road from Myrtle Beach in Leland, North Carolina is a new course designed by Rick Robbins – a native North Carolinian whose family helped develop much of Western North Carolina. Rick Robbins worked with the famous Jack Nicklaus for years on golf courses all over the world – including a number of courses in China. He is known for his vision for using the best that the land has to offer and Compass Pointe Golf Club is no exception. Mr. Robbins wanted this golf course to not only offer scenic views, but be flexible to play for the golfers of all skill levels. This includes making 5 tee boxes – one being family tees that make it fun for everyone to play – including grandparents, parents and children! 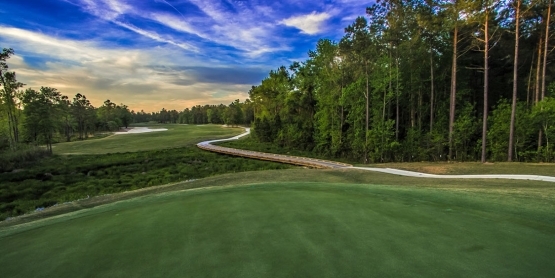 The Compass Pointe Golf Course is the newest golf course opening in late 2016 in Southeastern North Carolina. This wonderful golf course will be a treat to add to any Myrtle Beach golf package featuring scenic views and elevation changes that are rare in the coastal setting. The designer wanted to create a design that was environmentally friendly with natural drainage that also protected the natural areas and allowed water conservation. Compass Pointe Golf Club features a rarity in the golf community with push up greens using the actual sand from the area. The elevation of this Myrtle Beach area golf course ranges from 23-75 feet above sea level – quite the difference in a coastal community golf course! Because of the natural drainage that was designed with this course, you can play very quickly after a rain without the wait. The one unique feature of Compass Pointe Golf Course is the tee boxes. Designer Robbins wanted to create not only a challenging course for all skill levels but wanted to include families and beginners. Each hole has a “family” tee box that allows each hole to be played as a Par 3! The designer didn’t want this course to be just for the family either, so the final 2 signature holes are impressive and will provide a challenged for even the experienced golfer as well. Add Compass Pointe Golf Course to your Myrtle Beach golf package for a fun and scenic experience for all golfers of every skill level.